Gwendolyn of the Golden Locks is not after some porridge or a place to sleep. No. She’s after the heads of the three bears. Tension between shifters and non-shifters has been mounting for some time now. Shifters have taken to hiding under ground. Ricardus, the youngest of the bear shifter brothers, wants more out of life. He wishes to fight back against those who oppose them, namely Gwendolyn and her merry band. Will Ricardus find an ally in one of Gwendolyn’s followers? Or will the beautiful Edelina prove to be his undoing? Find out in this twisted retelling of Goldilocks and the Three Bears. 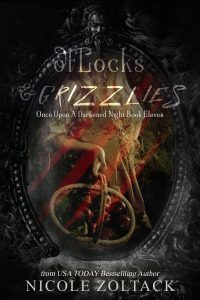 Of Locks and Grizzlies includes the short story The Cost of Devastation.